With an area of 16m2, our Standard Single Rooms are highly functional and furnished with single beds (1100mm). All the rooms are equipped with 32-inch LCD TVs. Standard Double Rooms have an area of 25 m2, and are furnished with queen-sized beds (1600mm). 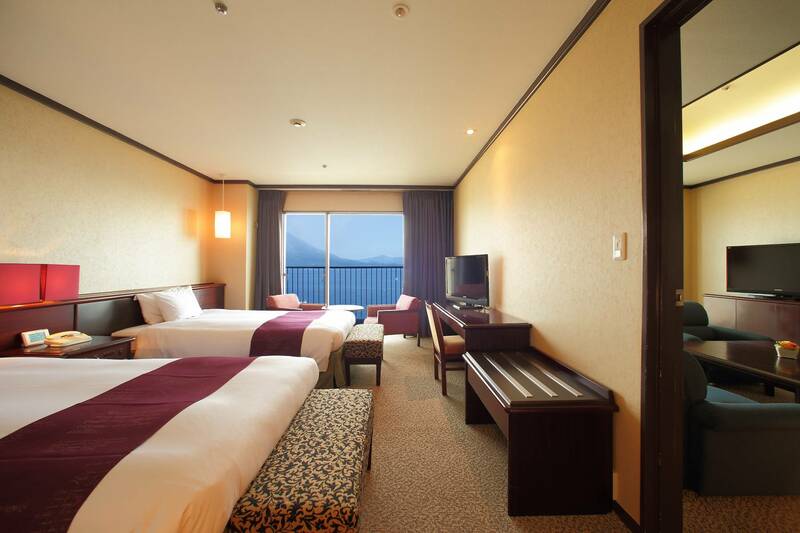 All the rooms are equipped with 32-inch LCD TVs and balconies overlooking Mt. Sakurajima. Standard Twin Rooms have an area of 25 m2, and are furnished with a pair of single beds (1100mm). 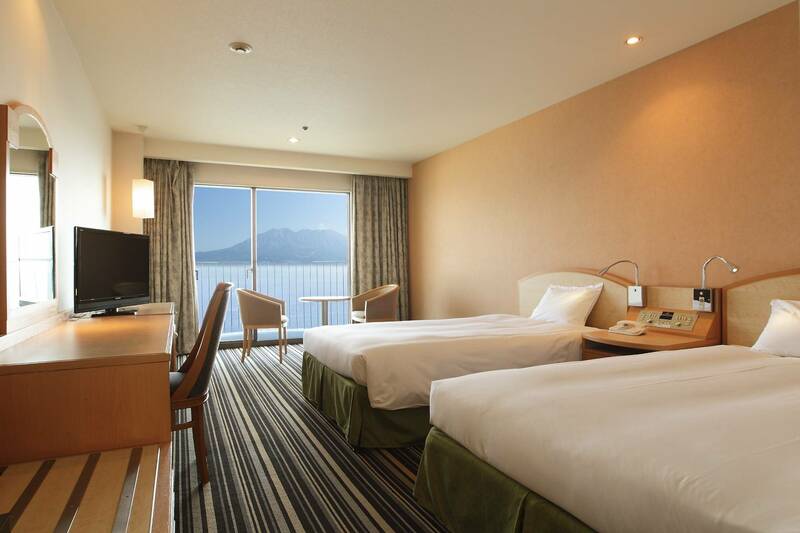 All the rooms are equipped with 32-inch LCD TVs and balconies overlooking Mt. Sakurajima. Deluxe Twin Rooms have an area of 30 m2, and are furnished with a pair of semi-double beds (1200mm). 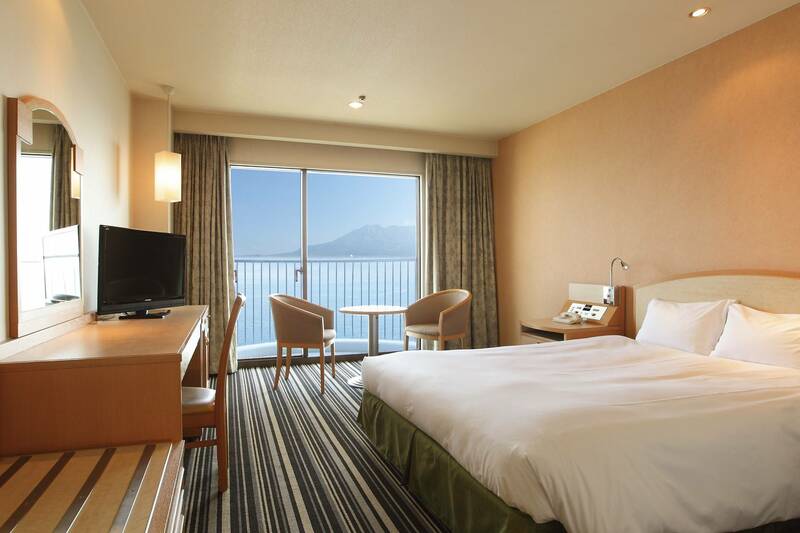 All the rooms are equipped with 32-inch LCD TVs and balconies overlooking Mt. Sakurajima. 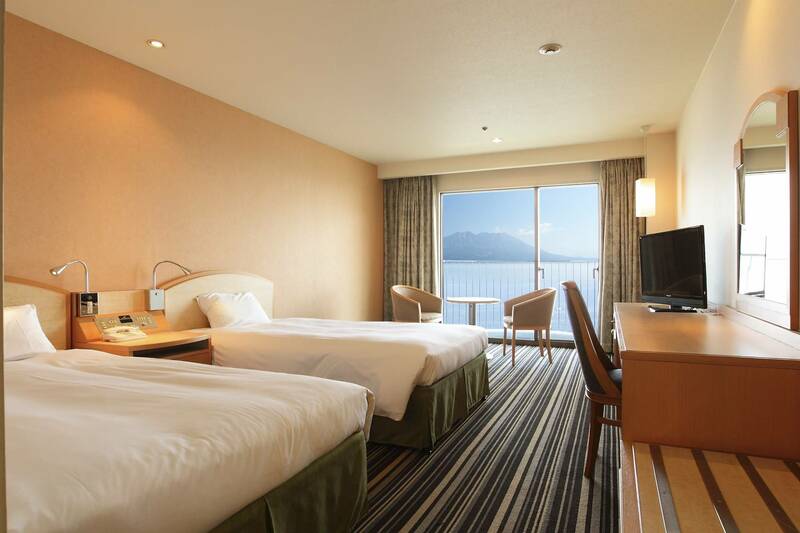 By the use of a stacking bed, Deluxe Twin Rooms can accommodate up to 3 persons. At 60 m2, each suite room is spacious and come furnished with a pair of semi-double beds (1200mm) in its 30㎡ bedroom. 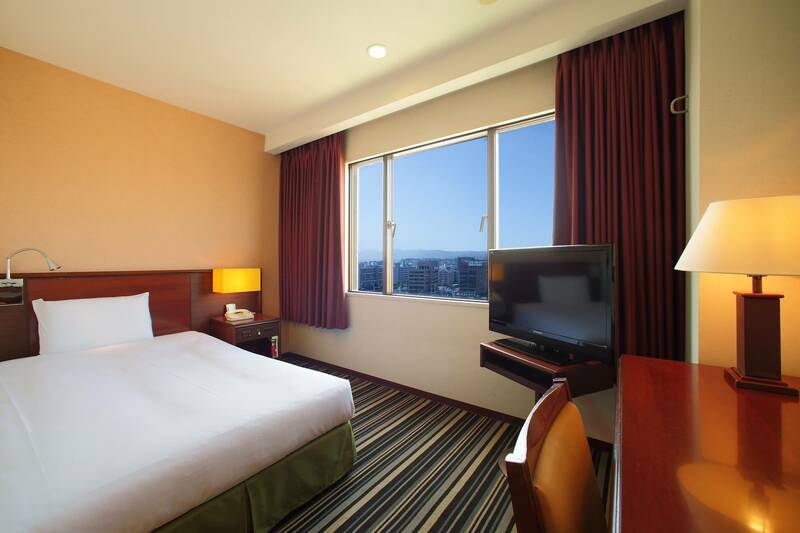 The bedroom is similar to our Deluxe Twin Room. And the parlor, which is also 30㎡, has sophisticated lounge furniture that creates a relaxing atmosphere. As each suite room has toilets in both the parlor and bedroom, the privacy of the room’s occupants is assured. The parlors are equipped with 40-inch LCD TVs (32-inch TVs for bedrooms) and have balconies overlooking Mt. Sakurajima. Free Wi-Fi (wired and wireless LAN) is available in all rooms. All the Single Rooms have views of the city. 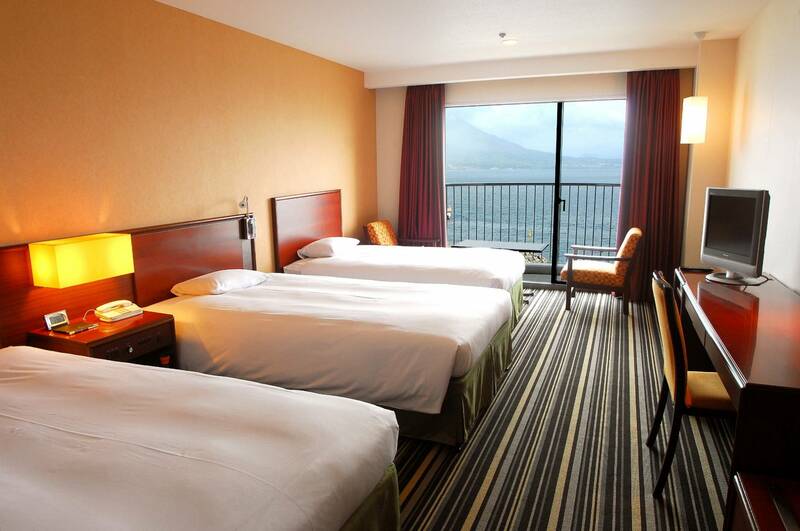 All Twin, Double, and Suite Rooms have en-suite balconies overlooking Mt. Sakurajima. 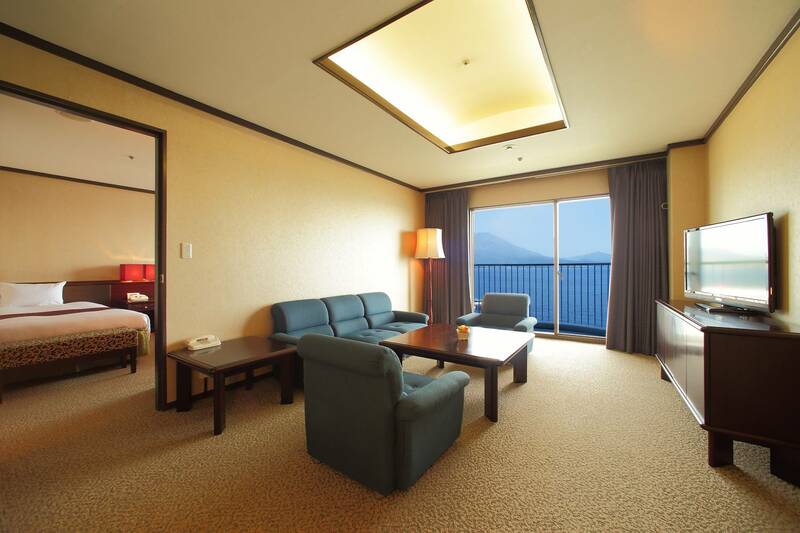 In these rooms, guests can leisurely view the picturesque scenery of Mt. Sakurajima as it changes through the season and time of the day.